Greetings again from the darkness. Jim Morrison’s lyrics, “This is the end. Beautiful friend. This is the end” have been interpreted to have many meanings over the years, and they also seem just right for what is likely the final on screen performance from one of the few remaining iconic movie stars. Robert Redford claims this is probably the end of his nearly 60 year acting career. If that’s true, he couldn’t have selected a better project for his victory lap. The film itself is a nice mixture of mass appeal and the independent projects that Mr. Redford has long supported. As for the character he plays, it too fits him like a glove. Filmmaker David Lowery (fresh off last year’s indie favorite A GHOST STORY) has adapted the story from a 2003 “New Yorker” article by David Grann, and it’s based on a true story – one that’s a bit difficult to believe … well, at least until Mr. Redford brings Forrest Tucker to life. Mr. Tucker escaped from San Quentin at age 70, and it was just one of his 16 prison escapes during a lifetime of robbing banks and getting caught. The story is that Tucker simply enjoyed the work, and went about it in the most gentlemanly possible way – often described by bank employees as polite and nice. It’s the perfect character for Redford’s trademark twinkle and grin acting style. Most of this portion of the story takes place in 1981, and the film captures not just the era, but also the essence – something much deeper than clothes and cars. Starring alongside Mr. Redford is Sissy Spacek as Jewel, and their chemistry allows the quiet moments between their characters to work as effectively as their (sometimes) playful verbal exchanges. Tucker’s “crew” is manned by Danny Glover as Teddy, and the great Tom Waits as Walter. Waits is always fascinating to see on screen, and here he gets one especially good scene to shine. They are referred to as “The Over the Hill Gang” (in contrast to “The Hole in the Wall Gang” from Redford’s classic BUTCH CASSIDY AND THE SUNDANCE KID. Casey Affleck (reunited with director Lowery for the third time) plays Austin Texas detective John Hunt, who spent a great deal of time chasing Tucker, and actually put the puzzle pieces together. Tika Sumpter appears as Hunt’s wife, Gene Jones is memorable as a Bank Officer, and for you Austin music lovers, Lefty Frizzell’s granddaughter makes a brief appearances. Other far too brief appearances include Isiah Whitlock, Jr, Keith Carradine (weirdly brief), Robert Longstreet, John David Washington, and Elisabeth Moss. The parade of familiar faces can be a bit distracting, but it’s understandable why so many wanted to work with Lowery and Redford. Joe Anderson’s cinematography is terrific, and the film is oddly devoid of violence. If not mistaken, I believe we only see Tucker’s gun once … and that’s in a glove compartment. 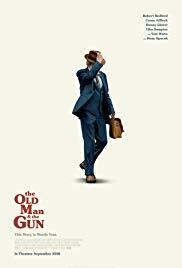 There is a certain easiness and warm fuzzy to the film, somewhat conflicting with what we would expect following an armed bank robber! Of course, the reason we buy into the gentlemanly outlaw is the performance of Robert Redford. Charming and easy-going comes pretty easily to a man that is charming and easy-going. Director Lowery even treats us to a quick clip from young Redford’s film THE CHASE, and does so within a delightful montage of Tucker’s prison escapes. Few actors get such a perfect farewell tribute, and though it’s not quite Ted Williams hitting a home run in his final at-bat, at least Redford gets to tip his cap to the fans. Since he’s moving his career off screen, let’s bid a fond and appreciative farewell to the man that once proclaimed, “I’m better when I move”. Greetings again from the darkness. All movie watchers know that the first rule of Fight Club is ‘Don’t talk about Fight Club’. And now we know that the first rule of Telemarketing is STTS: Stick to the script. 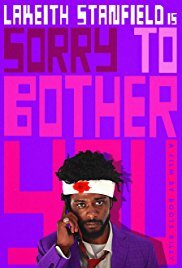 The similarities between the two movies may be few, but hip-hop artist (The Coup) turned first time filmmaker Boots Riley comes out swinging in this offbeat, quite clever satire on race, corporate culture, economic factions, social division, and politics. It makes for a nice companion piece to last year’s critical darling, GET OUT. LaKeith Stanfield (GET OUT, SHORT TERM 12) stars as Cassius “Cash” Green, a low key good dude living with his girlfriend Detroit (Tessa Thompson) in his uncle’s (Terry Crews) garage. Four months behind on rent, Cash wants to do something important with his life, he just doesn’t know how … and his current financial circumstances aren’t helping. You may call him a dreamer, but he’s not the only one (a Lennon reference seems fitting for this film). Cash’s best buddy Salvador (Jermaine Fowler) gets him an interview at a dingy basement telemarketing firm – an interview that clues us in on the type of humor we are in for. Thanks to advice from one of the veteran telemarketers (Danny Glover), Cash utilizes his “white voice” and immediately has remarkable success … and we get some pretty funny sales call visuals to correspond to the obvious capitalism statement. Ultimately his sales success gets him promoted to the “power caller” level and his own mentor, accessible only through the gold elevator. This leads to conflict with his friends, his girlfriend and his own moral standards. See, the basement dwellers are being led by Squeeze (Steven Yeun) in an effort to unionize for a living wage and tolerable work environment. As Cash continues to pursue … well, uh … cash … his friends carry out their form of civil disobedience. This leads to police brutality, examples of corporate greed, and the downside to individual ambition. Armie Hammer plays Steve Lift, the egomaniacal corporate d-bag who takes Cash under his wing – for the purpose of making more money. The sales pitch turns to “Worry Free”, a lifestyle being marketed through brain-washing advertisements for guaranteed food and shelter. One need only commit to a lifetime of corporate servitude. If that sounds like slavery, well, that’s the point Riley is making. It’s not so far off from the life many of us lead today, but of course this is presented in satirical fashion, so we are manipulated into laughing at ourselves and our society. There is even a popular reality TV show titled “I Got the S**T Kicked Out of Me”, and folks can’t get enough! The story kind of flies off the rails in the second half with some wacko-science fiction genetic engineering. The equisapiens have to be seen, as no written description will do. Even this segment has purpose. It speaks to how individuals and corporations can seize power and head in a questionable direction – all in the name of progress, efficiency and stock price. Stanfield excels in one of his first lead roles, and Ms. Thompson is her usual shining star. Kate Berlant (as the humorously named Diana DeBauchery) has a couple of excellent scenes, and David Cross and Patton Oswalt are terrific as the (extremely) white voices of Cash and Mr. _________ (played by Omari Hardwick). Filmmaker Riley offers up not a call to arms, but rather a call to wake up! Many of the decisions here mirror real life. Personal success can cost us friends, and political and professional choices may challenge our inherent morals (here, bordering on Faustian). The film is both provocative and funny, though a bit messy at times. You’ll laugh while you think, or laugh after you think, or think after you laugh … somehow you’ll do both. OFFICE SPACE and Terry Gilliam’s BRAZIL may be the closest comparisons; just be cautious if Boots Riley ever invites you to join in some horse play.